Not to be taken by pregnant or lactating women. Consult a health professional before taking this or any other product. 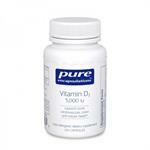 It is recommended that individuals taking more than 2,000 iu vitamin D per day have their blood levels monitored.